So finally my work in Mumbai is coming to a close. 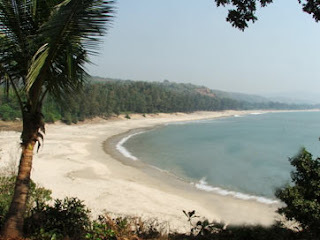 Over the weekend we went to Alibaug, a quiet town about 1.5 hours from Mumbai. It has a number of beaches, pleasant climate, hills to suit those wishing for some adventure. Within 30 kms from the center of Alibaug one can go visit the beaches or climb onto the hills around, especially the wonderful Kankeshwarya Mandir(I am sorry if I get the spelling wrong). The rooms that we were put up in were ok, and all day was spent in relaxing. By the time it was afternoon, we went to the hill temple, climbing about 1000 steps one at a time. The breathtaking view from above was awesome. The horizon spreading into the infinite – the hills, the Pratapgarh fort in the distance and Alibaug town below was a magnificent display of natural splendor. Of course, the most important reason I loved the trip was that she was with me. She really struggled to get up the slopes. Anyway somehow she managed. The temple was beautiful. So was the dog that sat in front of it. It was serene and peaceful – not yet a prey of rampant commercialization. After coming down with the setting Sun, we went to the nearby docks – I don’t remember the name of the place. It was quite dark but we could make out the city of Mumbai in the distance. The place was very windy and we enjoyed it a lot, wishing we could fly in the air. I asked her to stretch her arms facing the wind and close her eyes for some time. We both did. It was lovely. After sometime we left that place and returned to our rooms.